In 2016, the UK issued more first residence permits to non-EU citizens than any other member state. That’s not a great surprise; but ask people to guess which country came second in the list and few would get it right. The answer is Poland, which gave out 586,000 permits, almost a fifth of all those issued across the entire European Union and well ahead of third-place Germany, with 505,000. The EU data for last year are not yet available, but Poland’s numbers could be even higher. Figures released by the country’s Central Statistical Office last month show that in 2017 Poland issued almost twice as many work permits as the previous year, and four times more than in 2015. By far the majority of these new arrivals are Ukrainians, who made up 82% of work-permit recipients last year. This mass movement of Ukrainians to Poland in the last three years is, in fact, the biggest and fastest migration of people from one European country to another in recent history. Precise figures are hard to come by, but it is estimated that somewhere between one and two million Ukrainians have come. (For comparison, in the three years after Poland joined the EU in 2004, the Polish population of the UK increased by around 300,000.) The sound of Ukrainian-accented Polish has become commonplace on Polish streets. Wrocław, Poland’s fourth-largest city, claimed last year that Ukrainians make up 10% of its population. In contrast to many western countries, where large waves of migration have created resentment among natives, Ukrainians have met with little hostility from Poles, who generally appreciate their economic contribution and seamless integration. Intermittent attempts by far-right groups to organise protests against Ukrainian immigration have been unsuccessful, with attendance usually not higher than double figures. Beyond the Ukrainian majority, there have also been growing numbers of migrants from further-flung locations too. South Asian Uber Eats couriers have become a ubiquitous sight pedalling around the streets of Warsaw (and playing cricket in its parks). The ever-expanding network of international firms establishing back offices in Poland also employ many foreign workers. In 2017, over 13,000 work permits were issued for Nepalis, Indians and Bangladeshis combined, which is more than four times higher than the number in the previous year. Last month it was reported that the Polish embassy in New Delhi is struggling to cope with demand for work visas from those three countries, with a backlog of up to 25,000 applications from people with offers of work in Poland. What is particularly striking is that this wave of migration, unprecedentedly large and diverse for Poland, has taken place under a government that is routinely described (including by itself) as ‘anti-immigration’. This label is rooted in the ruling Law and Justice (PiS) party’s response to the migration crisis of 2015. Then in opposition, it stridently opposed the reception of asylum seekers, who Jarosław Kaczyński, the party’s leader, warned would try to ‘impose themselves’ on Poland in a ‘very violent and aggressive way’ and would bring ‘all sorts of parasites and dangerous diseases’. This position was contrasted to the Civic Platform-led government of the time (which had agreed to the EU’s refugee-relocation plan), contributing to PiS’s return to power in elections that autumn. Since then, PiS has continued to staunchly and vociferously oppose the relocation plan, refusing to accept a single refugee from Poland’s quota, resulting in the European Commission taking it to court. It has repeatedly criticised the ‘bloody harvest of multiculturalism’, political correctness and other ‘social diseases’ that it says blight western Europe as a result of immigration. State media, which have become a mouthpiece for the ruling party, reinforce this message with anti-immigrant scare stories (often based on false evidence), while PiS-linked private outlets have gone even further in stigmatising immigrants generally and Muslims in particular. Yet while cultivating this public image, senior government figures have more quietly been sending signals that they are comfortable with, indeed supportive of, large-scale immigration. Two years ago, Mateusz Morawiecki, then the economy minister, told a small audience at the elite economic forum in Krynica that Poland needs to take ‘intensive action’ to counteract the declining size of its workforce and that he would therefore ‘try to make a friendly invitation to several hundred thousand Ukrainians workers’. This year, now as prime minister, Morawiecki again emphasised that Poland needs immigrants to fill gaps in the labour market. Likewise, his minister for investment and development, Jerzy Kwieciński, says that ‘our economy needs more and more foreign workers’. The entrepreneurship and technology minister, Jadwiga Emilewicz, admits the government is ‘ready to open its borders’. These words are, moreover, being matched by concrete action. The government is preparing a ‘new national migration policy’ that will make it easier for non-EU immigrants to settle and work in Poland. As part of this process, it intends to expand the list of countries with privileged access to the Polish labour market from the current six former Soviet states to also include Southeast Asian countries like Vietnam and the Philippines. Negotiations are already underway to conclude a specific agreement with the Philippines to facilitate migration to Poland. Last year, during a visit to Bangladesh, the minister for family, labour and social welfare, Elżbieta Rafalska, told her hosts that Poland wants to welcome more Bangladeshi workers. The two sides agreed to establish a joint study group to help make this happen. ‘Poland keen on immigrants,’ headlined one Bangladeshi newspaper after the meeting. Ministers have made clear the reasons for this pro-immigration policy. Poland has an ageing society, one of the world’s lowest birth rates, and a large number of citizens working abroad. Combined with a booming economy, this has left unemployment at record lows, with wages rising fast and many employers struggling to find workers. As a consequence, business groups have been lobbying the government to let in more migrants. Yet these economic imperatives are increasingly clashing with the party’s public hostility towards immigration. It appears that a more business-orientated faction (including the prime minister, who is a former international banker) is being pitted against more nationalist figures within the party and among its potential voters. This is a tension that lay largely dormant for PiS’s first couple of years in power, but now, with immigrants becoming ever more visible and a series of important elections approaching, it is increasingly coming to the fore. The far right has also played a role in drawing greater attention to the issue. Krzysztof Bosak, a nationalist leader with a large online following, has been using his platform to raise questions about immigration. In May this year, he prompted national debate by commenting on the prevalence of Indian food-delivery drivers in Warsaw, saying that it is time to discuss whether Poland wants to head down a multicultural path. In August, another nationalist live-tweeted an event at a conservative think tank, during which the deputy minister for investment and development, Paweł Chorąży outlined the government’s plans to facilitate greater immigration from the east, including countries like Vietnam and India: ‘Poland must [open up to migration] and even if it doesn’t want to, it should want to, because the prosperity of those countries that have achieved the greatest success is built by migrants.’ He added that bringing immigrants from Asia was cheaper than repatriating ethnic Poles from the former Soviet Union (something nationalists favour), though stressed that the latter remain ‘a priority group’. Chorąży’s words, while more explicit and enthusiastic, were in substance little different from those openly expressed by more senior ministers, as we have seen. But this time they attracted far more attention, angrily amplified by nationalists on social media. This clearly rattled the government ahead of upcoming local elections. PiS’s campaign chief stated that he can ‘guarantee there is not, and will not be, any government programme regarding the mass reception of immigrants. The security of Poles is paramount’. The interior minister, Joachim Brudziński, has taken to Twitter on more than one occasion to issue similar denials. It was then announced that Chorąży had been fired, with a government spokesperson saying that ‘the minister’s comments on immigrants were extremely contradictory to what the government is doing’. A source in the prime minister’s chancellery said that Morawiecki ‘was furious’ with Chorąży and that there ‘cannot be someone in the government who has such extremely different views from the government’, which has a ‘clear anti-immigration policy’. This episode neatly encapsulates the bind the government finds itself in: trying to persuade its base (and perhaps itself) that it is opposed to immigration while at the same time accepting the economic arguments in favour of it and letting in record numbers of foreign workers. This has resulted in an approach echoing one of Lech Wałęsa’s famously logic-defying statements from his time as president: Jestem za, a nawet przeciw (I am for, and even against). PiS would ideally like to resolve this dilemma in the short term by encouraging the return of Polish emigrants from the West and ethnic Poles from the East, and in the longer run by boosting the birth rate. Yet the government has pursued both these goals to limited effect: some émigré Poles have been returning, but not in particularly large numbers; a new child-benefit programme boosted the birth rate a little, but nowhere near enough. It is therefore vital not just for the government itself, but for society more broadly to have a conversation about whether, how and to what extent immigrants should be encouraged to fill gaps in the labour market. But the signs so far are worrying. The government is trying to have the best of both worlds: permitting mass immigration on the quiet while publicly claiming to be opposed to it. This is not a sustainable situation. At some stage, tensions will erupt among sections of the public who feel that significant changes to their society have been made without their consent. The conversation has been made even harder by the fact that the xenophobic rhetoric provoked by the refugee crisis, including from PiS itself, has turned ‘migrants’ and ‘migration’ into catch-all negative terms, without differentiation between their various forms. So, although hostility was being expressed towards African and Middle Eastern asylum seekers and not immigrants per se (as the peaceful large-scale arrival of Ukrainians has shown), the idea of migration has now become so toxic that it is difficult to discuss constructively. This confusion is indicated by the anonymous chancellery source cited above, who, as evidence of the government’s anti-immigrant position, mentioned its opposition to ‘relocation projects’ like the EU’s refugee programme. Yet this has absolutely nothing to do with the voluntary economic migration from Asia that Chorąży was talking about. Likewise, when government figures refute claims of a pro-immigration policy, they often associate this with protecting Poland’s security, despite the fact that Ukrainian, Filipino, Indian and Vietnamese workers do not represent any kind of security threat. 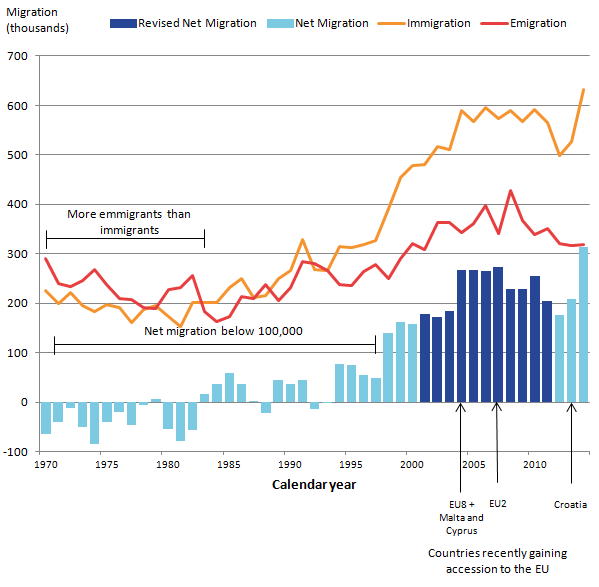 Subsequently, the Conservative Party took office in 2010, famously promising to reduce annual immigration to below 100,000. Not only did it fail to meet this target, but immigration actually continued to rise, reaching its highest ever level in 2015. As a consequence, anti-immigration attitudes in Britain hardened, as did distrust of the political class. This played a large part in the Brexit vote, as well an exodus of voters from the main two political parties to the right-wing populist UKIP, which got a record share of the vote at European and parliamentary elections in 2014 and 2015. Yet PiS shows no signs of learning from such negative examples to construct an immigration policy that has popular consent. Instead, it appears to hope it can continue reaping the economic benefits of immigration while avoiding public discussion of it. So far, it has largely got away with it. But changing circumstances – an economic downturn, say, or simply the growing visibility of a more diverse society – could upset this uneasy balancing act. This could have dangerous consequences, stoking support for far-right groups and provoking a backlash against immigrants themselves. To avoid this, it is in the interests of the government to talk more openly about what kind of migration policy the country needs, and to let the public express their views on the kind that they want. Port officials in Italy were routinely filmed wearing white face masks. The reason is that large numbers of immigrants had come from places where multi-drug resistant tuberculosis is rampant and where the United Kingdom imposes TB clearance certificate requirements. Hotspots of multi-drug resistant TB have occurred in Germany and Sweden, but are not reported outside of specialist medical reports or the utterances of obviously deranged Polish politicians. On the subject of South Asian immigration, it should be added that I have personally met Indian “students” who have simply come to Poland to work. As for Ukrainians, my schoolteacher wife has direct contact with Ukrainian children and they are integrating very well indeed, if not assimilating. The language and culture are very similar and the young ones are on course to becoming properly Polish. Incidentally, I wouldn’t quote Walesa on anything. He took – and personally signed for – a lot of money from the Communist secret police. You need to understand the difference between controlled immigration and illegal immigration before writing about it. Although, I bet you do and someone paid you to promote biased arguments. As ever a well balanced enlightening report. I suspect that immigration is going unnoticed as it if focused around the larger cities, where populations tend to be more tolerant and educated, and an immigrant is more anomalous. I dont think you are going to find an Indian shopkeeper in a town in Southern Poland anytime soon. I believe the problem in the UK was that the government never made a distinction between EU migration and those from outside the EU, the only numbers that they could potentially control. And that is the key, control, and as you quite rightly say as long the Polish government admits that it is taking migrants, as long as they explain that it is controlled, then then may just get away with it, but explain they must otherwise you are filling a powder keg.